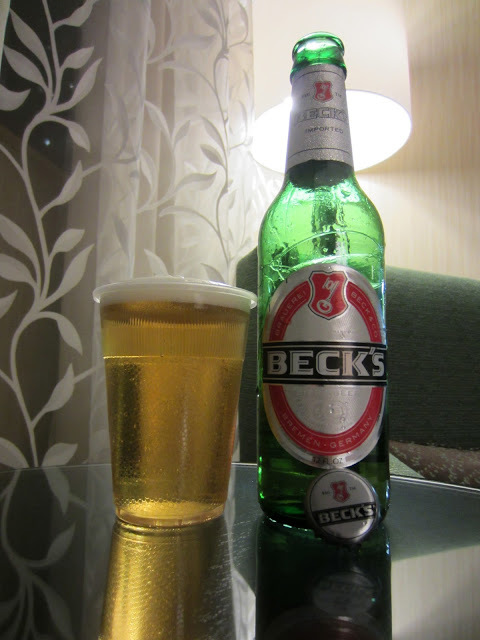 This well-known German pale lager pours a medium pale straw body, crystal clear with a fast-rising carbonation. The light and fluffy white head builds quickly to a medium size and features modest retention, but leaves thick swathes of lace as it fades. The nose is stinky with the signature Euro lager aroma. Skunky hops give a vague Pilsner-like profile. Light maltiness rounds out the base. The beer is very crisp and gives a light and airy body. Malts are very sweet and almost honey-like. A minor sour graininess comes through on the mid-palate and are matched by a light dusting of dandelion-like bitter hops, which bring forth the Pilsner profile of Noble hops. The flavor fades fast, but leaves a minor skunk on the finish and a moderate crisp bite. The Winter Beer 2011 pours a chestnut body with a lightly tawny complexion. Amber and yellow glow through at the base of the glass and a large tan head of frothy foam fills the opening. The nose is spicy with prominent vanilla, mild cinnamon and fragrant oakiness. Sweet toasted malts and heaps of caramel fill out the grain profile. Satiny carbonation hits immediately on the front end and slides smoothly into layers of caramel sweetness. Dark earthy tons aid the emphasis of Winter spices. A hint of vanilla adds some additional sweets and a light milkiness plays well off the caramel grains. Oak flavor develops quickly and is intense from the mid-palate through the finish. A slick, oily wood leads the beer out and leaves the palate with a light seche aftertaste. 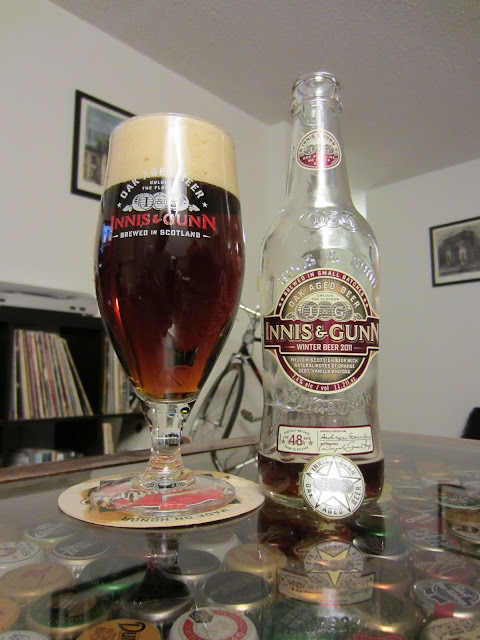 One of the last times I left off on posting I was right in the middle of reviewing a sample pack of beers from Innis & Gunn. Now that I'm trying to get some posting going again, it is time to pick up with the Rum Cask aged offering. The beer pours a lightly rubied mahogany with a striking clarity and glow. The head is a medium-large off-white foam with a lightly tanned tinge. The foam is light and airy and musters a moderate retention and lacing. Rum is obvious on the nose with tons of vanilla and oak influence also present. Very minor licorice sneaks in at the edges and adds a light punch to a healthy malt aroma with light sugar and a modest alcoholic infusion. 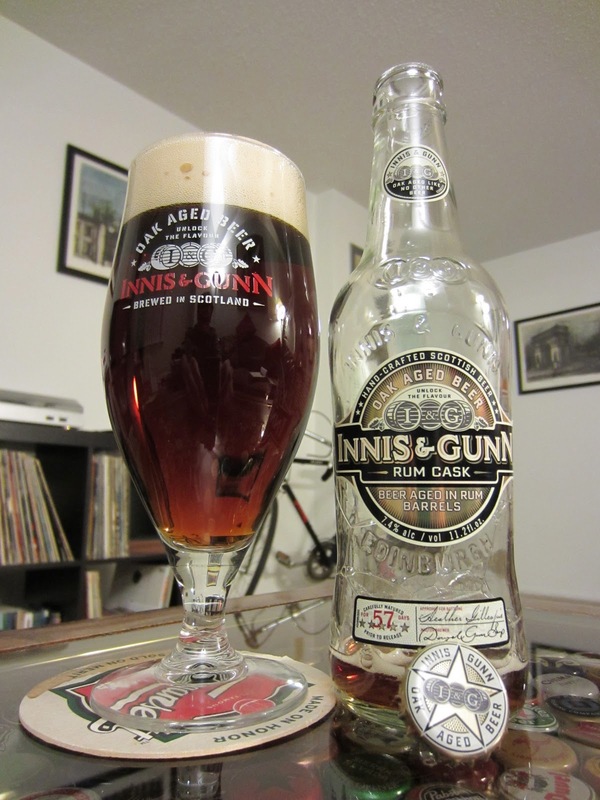 The sweet maltiness of a Scottish ale is apparent, but like the standard cask aged Innis & Gunn, barrel flavor dominates the palate. Sweet woody oak and dry vanilla flavors are clearly imparted from the barrel and dark rum influence brings layers of spiciness and a light fruit flavor. The mouthfeel is slick with a tinge of carbonation on the finish. Huge rum notes carry through to the aftertaste and a hint of heat fills the back of the palate and the chest. Overall a tasty and enjoyable beer, which brings dominant barrel flavor to a solid malty beer.